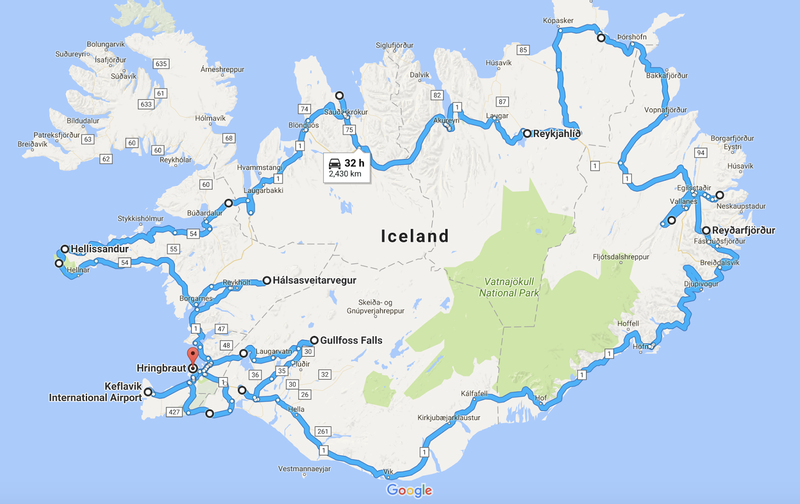 12 days in Iceland, 10 by Campervan! 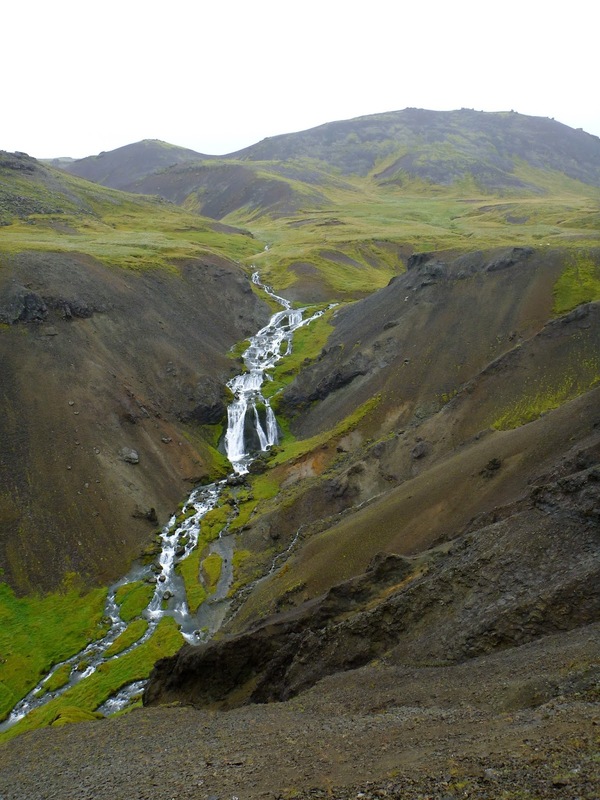 Well, today I found myself on another solo adventure, this time Iceland camping for 2 weeks! 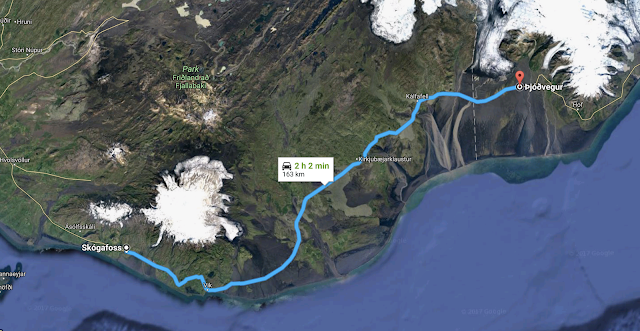 My journey would begin with a quick Westjet sprint to JFK New York, followed by a 4 hour layover, and finally a 6 hour redeye with Icelandair to Reykjavik. After enduring the painful gong show in JFK (terminal 7...avoid at all cost! ), plus succumbing to my damn guilty pleasures with Mcflurries (which by the way left me feeling lethargic the entire flight over the Atlantic), I finally found myself in Iceland...and unfortunately in my usual zombie state!! Jet lag was going to be my biggest hurdle today due to my typical zero sleep on planes. My plan was to jump on a Flybus shuttle to Reykjavik town centre, pick up my campervan, (which would be my home for the next 11 days), load up at the local “Bonus” grocery store, and finally, tour the golden circle, (which I figured I could gloss over seeing it was reportedly the most touristy and less interesting part of Iceland). Well, things didn't get off to a good start! First off, my luggage was lost in New York, so not only did I have no warm or waterproof cloths, but it was also pouring outside. I tried to stay calm and roll with it, (knowing I had roughly $2000 worth of technical shell jackets and hiking shoes packed away on my checked-in luggage was not helping). After signing a few forms, getting to Reykjavik from the airport was painless, and as the sun tried to finally peak out, my campervan arrived... only 20 minutes late, (hey things were turning around haha). Departing Reykjavik, I tried 3 Bonus grocery chains before realizing they didn't open until 12:00, so I decided to starve myself on M&M's till the end of the day. So onward to the golden circle! First was the busy Pingvellir Park...thank God I didn't stay. Parking was 600isk ($8), and the views were average at best. Next on my itinerary was Bruarfoss...a lesser known waterfall. Unfortunately my attempt to get off the tourist track backfired. After 30 minutes of walking in empty fields along an unknown river, I gave up on the pursuit...guess there was a reason it was lesser known. 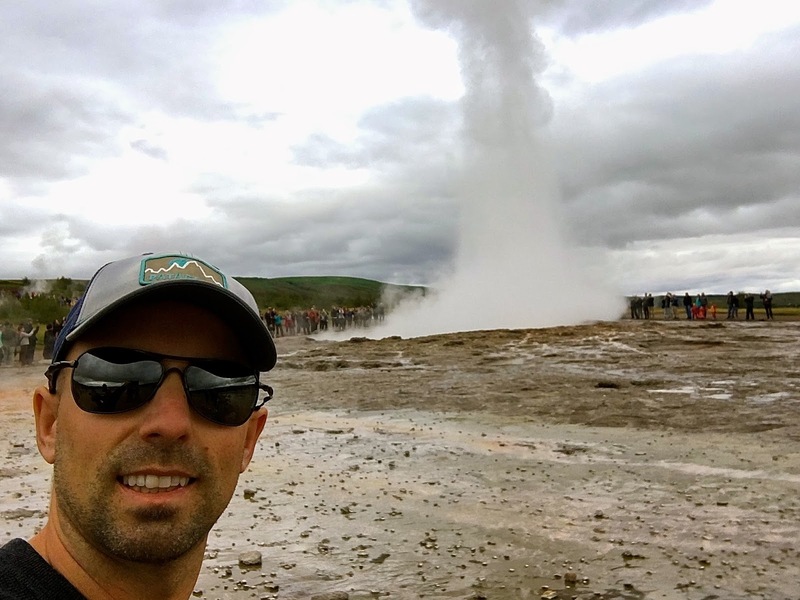 Next was the well know Geyser. Many online said it was average and could be skipped, especially if you'd seen one before. I didn't, so I gave it a chance, and happy I did! 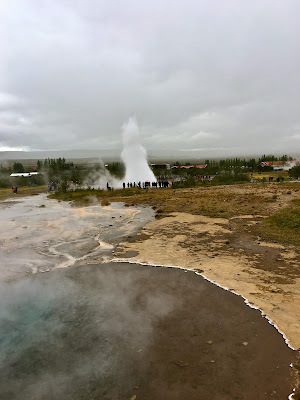 Today the geyser's activity was putting on a show, and some blows (is that the right word...blows?... Shots?) were huge, resulting in a very entertaining show! After looking at a few other hot bubbly pots nearby, I felt the 30 minutes allocated was sufficient and left happy seeing it. Last was Gullfoss. I wasn't expecting much from the many pictures and youtube videos I'd seen, but after 15 minutes walking the canyons edge...wow, it pleasantly exceeded my expectations big time! The two part falls were unique, and I loved how the mist sprayed straight up after slamming into the side canyon walls. Definitely impressive and a must see! Content on my day, I concluded the night with a 45km drive south to my first campsite in Hvaragerdi, but first a short stop in Selfoss for groceries was in order...hunger could not be ignored anymore, go figure! $40 later, I continued with the short 10km drive to my campsite and dove into my goodies to see what I could concoct. What resulted was an odd egg potato scramble...ah well lol. It was only 7pm, but all my camping neighbours were young couples, and they were not the most social people, so I decided to make up my bed and cash in for the night. 7am came quick as the rain repeatedly pulled me out of my slumber. I inhaled a quick banana and one of Icelands well known skyr yogurts, then departed for the Reykjadalur hike...in the rain...with only the 1 pair of damp jeans and cotton shirt I was currently wearing...in 9 degree weather...for 6km lol. Nothing was going to stop me from doing this hike, regardless of how stupid it was in my current state. The hike was amazing! 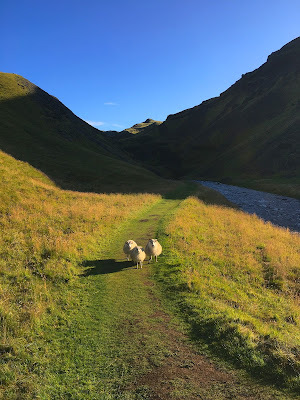 So beautiful and cliche with the rolling green hills, steaming valleys, sheep on every bank calling out to each other...classic Iceland. 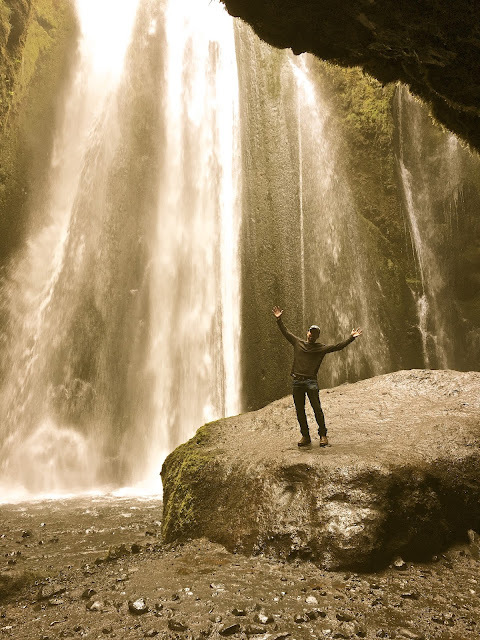 I couldn't help think how this once hidden gem had been uncloaked by its revealing geothermal steam, which invited us to this awesome wonder! As I laid in the secluded river with not a soul around me (I was first up, yup, and sporting only undies to boot), I took in the atmosphere...sheep surrounding me as they walked the grassy ridge-lines, the misty rain falling as the steam and stillness billowed endlessly, it was doing wonders for my ailing jet lag! Great 6 km hike, and a must!! After heading back down, I passed 40+ hikers, making me feel thankful I didn't have to share “the” spot, knowing they undoubtedly would. Back at my van, I grabbed a quick coffee, and off in the rain I went to my next attraction...Seljalandsfoss! The bad news: they closed the backside of the waterfall for falling rocks....ahhhh damn! The back up plan: hike to the adjacent falls close by for a different look. The problem: it was windy and pouring out! Seeing I had no cloths and I was already damp (damn you Westjet), I decided to write some of this blog in the van before venturing out. The patience paid off! The sun came out, and the entire place transformed, green fields popping in the sun with rainbows adding to the backdrop! Tearing myself away from the mesmerizing scenery, I met a fellow Canadian in the parking lot also traveling solo, so he decided to join me in Skogar...and off we went! Skogafoss was nice, but much of my time spent was waiting for the rain to subside. The lesser known Hidden Falls was my goal before the day ran out (which I didn't make due to my luggage not arriving in time). So after a quick bite of leftovers, followed by an appreciated instant cup of coffee made by my new neighbour, I waited for my luggage in the dark, and once finally delivered, I immediately went to bed...tomorrow would be a jammed packed day. Day 3 would turn out to be a very long day! It started at 6:30am driving to Seljavallalsug with the Torontonian tagging along for the ride, (he had no idea the place existed, hence why I love planning my travels instead of doing things on a whim). After an easy 20 minute hike, we arrived to a lush amphitheatre valley. The ambiance was perfect with just enough rustic-ness mixed in with some amazing valley vistas. The hot-springs pool (oldest built hot springs pool in Iceland) could have been a tad hotter, but we let it slide seeing it was still memorable for the effort. We relaxed for roughly 20 minutes until we felt ready to move on. A momma and 2 kids guarding the trail lol. Immediately after the falls, we went straight to the Fimmvorduhals hike which is usually a 25km full day ($50 bus shuttle back), but seeing we only had a few hours, we just opted to do 12km. The waterfalls were never ending right from the start, and seeing the glaciers off in the distance growing with every km gained made me wish we had more time. Midway through the hike, I parted ways with my new friend as I needed to keep the pace up, and his was not cutting it lol. 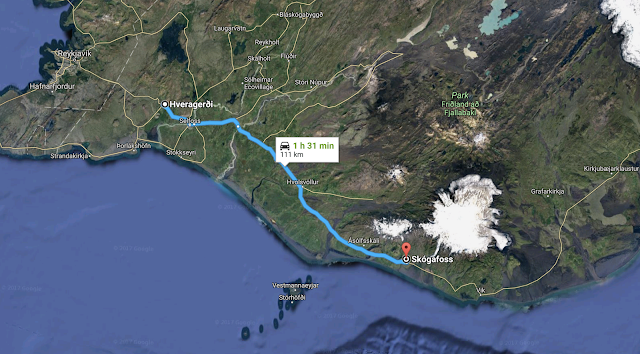 On my return, I ran down so I could still fit in the classic Solheimasandur plane crash site 30 minutes away. Next was Reynisfjara, nice ocean views with unique rock formations, but nothing I hadn't seen before around the world. Don't get me wrong, I love anything to do with the sea, but this just wasn't the classic Iceland you come for. Near by was the black sand beach in Vik, something I'd been looking forward to. The sand was pretty interesting for you sand buffs, jet black! Add the fact I was back at the ocean, left me with a refreshing and uplifting mood, but 20 minutes was all that was needed for this, and that's including sitting down and taking everything in. I decided to try to fit one more attraction in before I ran out of light. Fjadrarglijufer (say that 10 times), was a unique narrow canyon with interesting pillar features. I don't know if it was the lighting, or just too high of expectations placed on it, but I felt a bit underwhelmed here, and after 40 minutes, decided to go find my campsite. I was running out of light, and I unfortunately couldn't make it to the next designated camp location, so I bailed out and parked beside a massive cliff just off the highway out of site...it had an amazing feel to it, especially with absolutely no wind present. It basically was just me, the shadows casting down on me from the cliffs, and the bright full moon to help me recap the days activities. I had over 350km to drive today, so I needed to be efficient. Problem was, two of the sites would challenge this by absolutely mesmerizing me, causing me to be rushed by the end of the day. 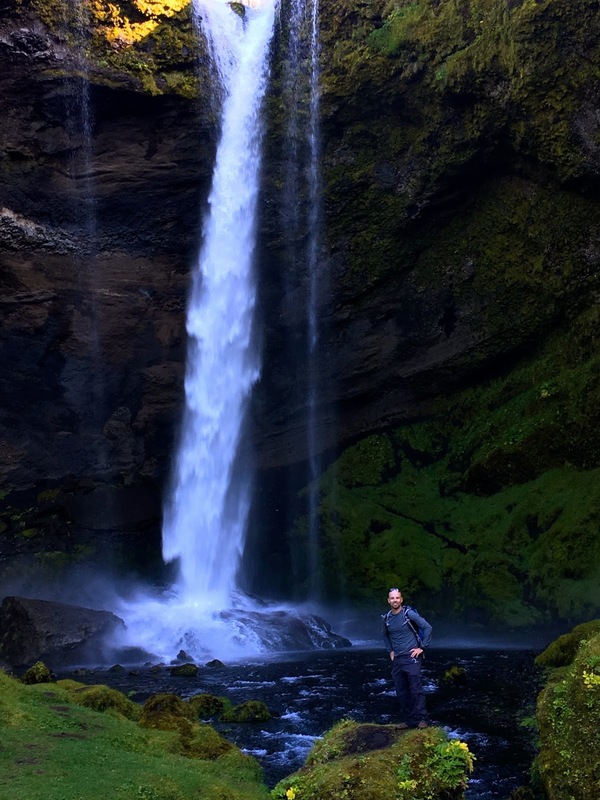 After breakfast, a short jaunt to Svartifoss was all that was needed from my makeshift campsite, and after talking to a few campers hanging outside the visitor centre, I oriented my way to the trailhead nearby. The hike was an easy 3km sprint, finished with a geologically impressive basalt cliff waterfall. It was just different enough to still be interesting after seeing hundreds of waterfalls the day before. The sun was already getting warm, and with only a t-shirt on, I felt very lucky to have this weather. I took in the sites for as long as I could before sprinting back down for my next destination some 50km away. I will do my best not to get too wordy for this next description, as it was that exceptional. Parking in an empty lot before the main entrance, I walked blindly over the glacial till mound not expecting much, (seeing there was no one around). 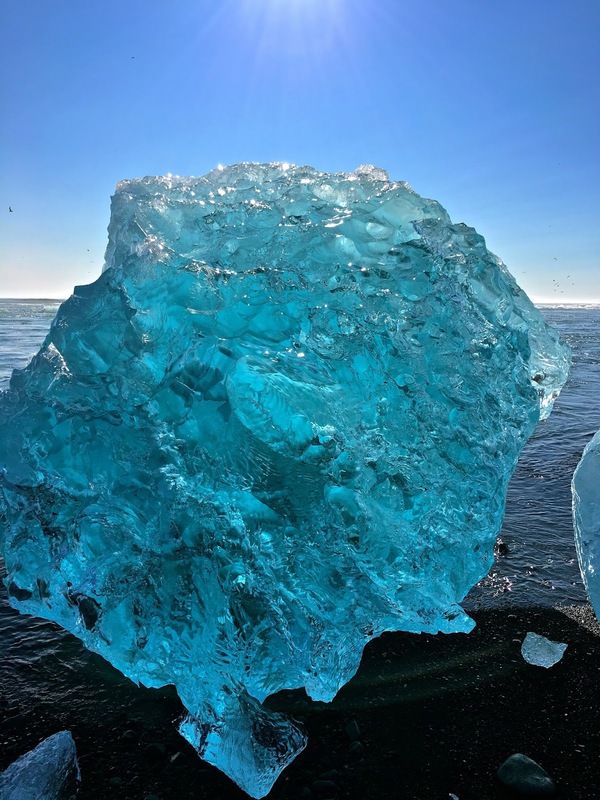 To my astonishment, I stumbled onto one of the more quieter banks of the Jokulsarlon Glacier Lagoon. The sites and sounds were literally breathtaking. Not only was I alone, (I was roughly 300m from the main entrance), but I really didn't think ice and water would do it for me like it was at that moment. Seriously, in Canada, we see it every day, but this was different, and I really can't put my finger on what it was. A curious seal came by to see what I was doing about before disappearing. 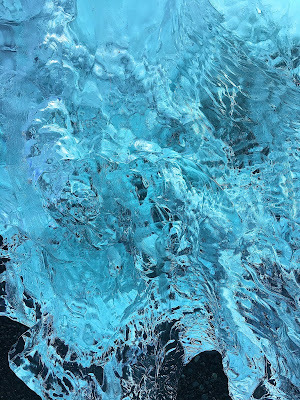 The crackling ice contracting in the sun was something I've never heard before either. The massive glacier in the background just added to this surreal atmosphere that was playing out in front of me. I spent over an hour taking it all in, studying different iceberg formations, watching them move to their targeted destination...the ocean, which was where I was headed next. Diamond beach is where many of the icebergs wash up to bask in the sun before meeting their final death. The sun was perfect today and I felt very lucky to be able to experience these optimal conditions, watching the sun light up the ice to give them that true blue diamond look. Before I knew it, I burned away 2 hours, back to the road! Continuing along the jaw dropping bird infested cliff coastline, I stopped in a few small towns, (more like micro towns) to get a feel what they were all about. 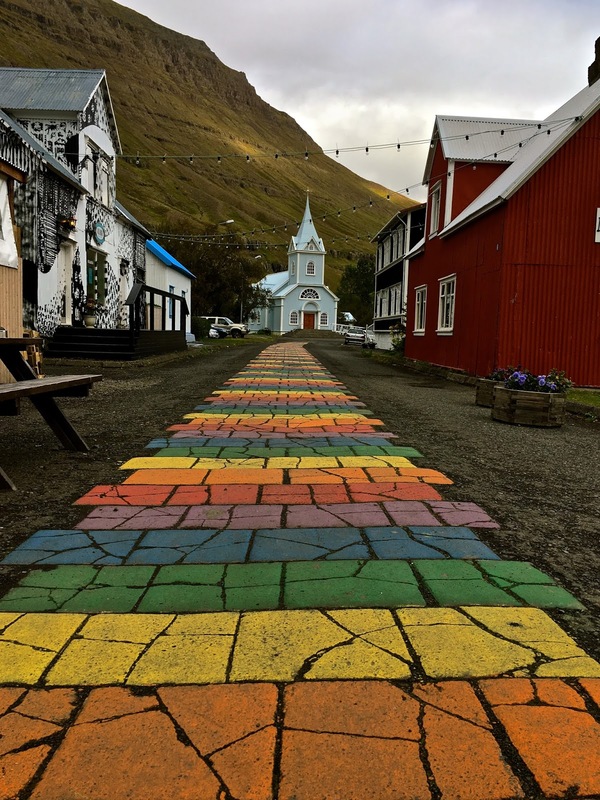 One example was Hofn, a quaint and quiet hamlet, all built around the harbour lifestyle, which summed up most towns throughout Iceland. Next was a hot-tub hot spring I had been curious to see. It had already been over a day since my last dip, so having one soon was due. 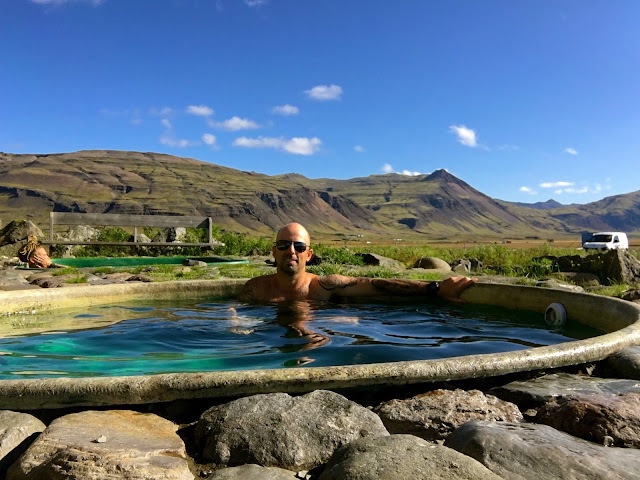 For 1000isk ($12), I relaxed my muscles in a small hot pot tub while gazing out over the expansive plains that met the rising mountains 60-some km away. An hour later, I felt re-energized to tackle a few more kilometres. 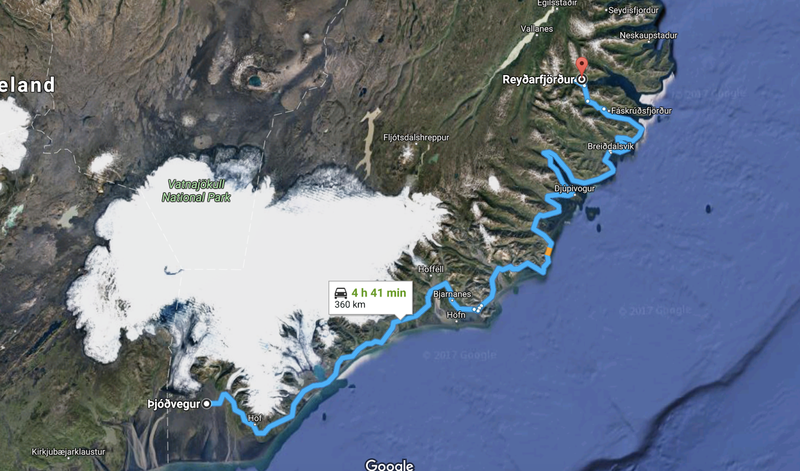 The NE fjords drive along the coast dipped in and out of large ocean bays, making the scenic drive long and enjoyable, but simultaneously forcing you to stay on edge while you hugged the narrow mountain side ledges. I needed to find a place to rest quick, but all I could think about was arriving to some campsite surrounded by introverted love struck couples doing their own thing. I decided...screw that, I want an ocean view room...so I parked my van beside a lighthouse (which I didn't know would flash all night haha) and as a result, had ocean views all night near Reydarfjordur. It was a short drive to Egilsstadar for coffee, followed by a straight shot uphill through the clouds and rain, over the baron east fjord highlands, and back down into Seydisfjorur...a quirky quaint town that resinated with the younger crowd. With a few minutes to spare, I charged my laptop for 10 minutes at the local campground before heading back up the hill to do a hike that would reward me with panoramic views of the valley and town, (I only needed to do a bit of 4x4ing to reach the trail head...no problem). In the end, the hike itself was average, but the views at the end was the cherry on top, which made it all worth while, and as an added bonus, it was still a good workout. I headed back down with a brisk jog so I could make up some time. I also took this opportunity to chase some sheep because everywhere you look, there was a momma sheep with 2 kids...always 2. They looked so silly when they ran, so how could I resist right? After completing the hike, I backtracked back through Egilsstadar and diverted south to hike Hengifoss, which was a bit out the way from the normal ring road route. The hike was 4km straight up, but the reward at the end was worth it. 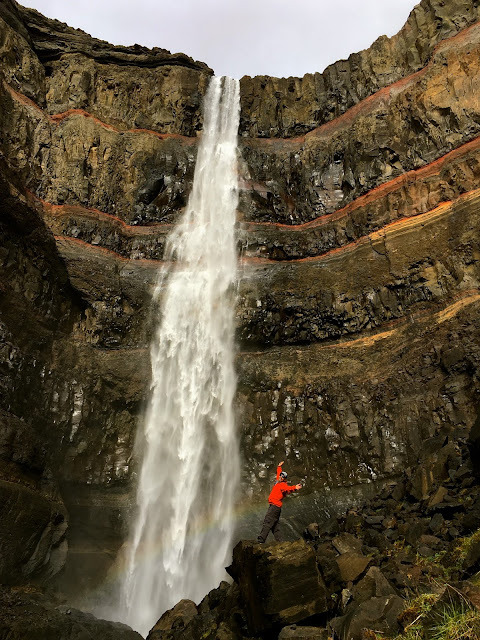 The towering falls had vivid red and black bands which made it stand out from the others. After taking some extra initiative to get right beside the spray for a better picture, it dawned on me I had spent almost 2 hours here...so I raced down and made the drive to Myvatn Lake. On the way through the baron highlands, I observed several hunters retrieving their prized caribou from the field, quite a spectacle. 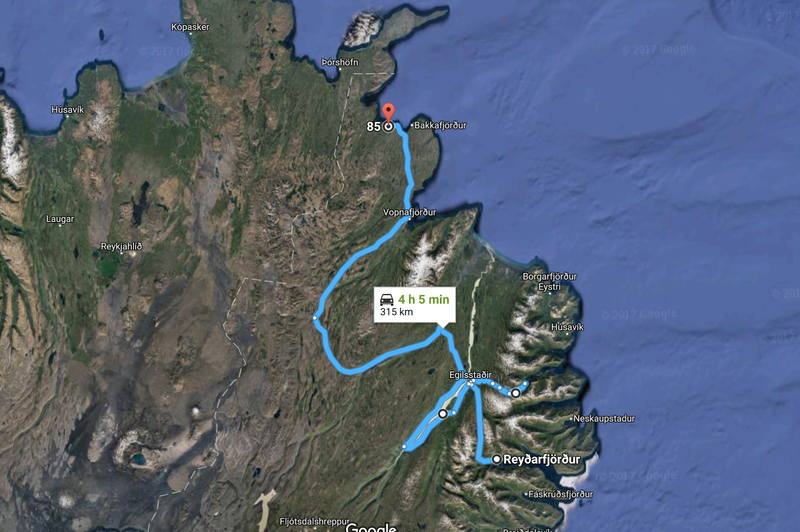 The drive was longer than expected, so I stopped in Vopnafjordur, (far north hamlet) for granola and gas (was really craving cereal), and at that point found out my 1 litre milk was a chunky gut wrenching smelly disaster. This was soul crushing to me knowing I had to forgo having my beloved cereal for the night. Back to pasta I guess.